Last week was an important week for the Duke Blue Devils, and it didn’t have anything to do with improving to all-time 15-0 in the Maui Invitational. Last week was important because Duke faced its two toughest opponents of the season thus far and responded by playing its two best games of the year. Michigan and Kansas are undoubtedly teams we are going to be hearing come tournament time as squads that could pose a threat to make deep postseason runs. I have to be completely honest—I was not at all certain Duke was going to be able to take its fifth Maui title coming into the tournament. This year’s field was one of the deepest and most talented the tournament had ever seen, and I wasn’t sure if this inexperienced team in the midst of its gelling process was ready to knock off ranked opponents on consecutive days. Clearly I was simply worrying too much. This team is truly starting to come into its own, and with a clearer rotation coming into focus, they look significantly more comfortable on the court, regardless of the obstacle they face. For a team that we knew would go through some growing pains at the beginning of this season, Coach K provided his team with an incredibly difficult non-conference schedule. But through all of the difficulties it has faced, this team is finding a way to win, and good teams win close games. Now let’s not get ahead of ourselves, my fellow Crazies, our toughest test of the year looms ahead when the team travels to Columbus to take on #2 Ohio State tonight. It’s a marquee non-conference game we’ve had circled on our calendar all year, but given that it was so early in the season, I never actually expected this Duke team to be ready to take on the Buckeyes. I always looked at it as a game we’ll view later on as a learning experience, not a game we could use to vault our team into the realm of national title contenders. But here we are, and after two signature wins in paradise last week, I will admit, this team is ready to play Ohio State. I am in no way guaranteeing a victory, but look for this game to be a knockdown, drag-out, heavyweight battle and don’t be surprised if by next Monday we look back on this game, and not North Carolina-Kentucky, as college basketball’s game of the week. One of the keys to Duke’s victory over Kansas was fantastic low-post defense from Mason Plumlee. Though on the outside Thomas Robinson’s stat line of 16 points and 15 rebounds looks like a bad omen for Duke’s defense inside, Robinson amassed those 16 points on just 6 of 15 shooting from the field. The Blue Devils will undoubtedly have an even tougher test in Columbus when they have to match up with Preseason All-American and Naismith candidate Jared Sullinger. Mason will have to try and cover one of the nation’s most complete players all over the floor tonight in hopes that he can force a similar shooting performance. I would include rebounding with interior defense as a key, but although rebounding is important, Duke has found ways to win games with no rebounding margin whatsoever. Although conventional basketball wisdom says the team that crashes the boards harder will probably win a given game, Duke has been outrebounded all but once in its last five victories. Ohio State is one of the best rebounding teams in the country, entering the game averaging 40 rebounds per contest, but the real key to this matchup will be taking away easy inside buckets. In a game where Duke will be collapsing to the interior to key on Sullinger, foul trouble is quite possible. The Blue Devils’ bench, especially the big men on the bench, will need to be ready for anything tonight. Look for Miles Plumlee and Josh Hairston to play crucial stretches to give starters Ryan Kelly and Mason Plumlee time to rest as they take on the physical Buckeyes. And of course, expect Tyler Thornton to play a huge role. Of course we all remember this shot. With his Thanksgiving feast to look forward to the next day, Ty didn’t just provide us with one helping of clutch—he went back for seconds. But down the stretch against the Jayhwaks, Thornton once again proved to us that he is capable of controlling the tempo of the game and running Duke’s offense effectively in crunch time. Look for him to see significant second half minutes in Columbus. When can you shoot a lower percentage than your opponents and still win a game? When your shots are worth more than theirs. The case that outside shooting is crucial can be made before nearly every Duke basketball game, but against a big and physical Ohio State team, inside buckets will be that much harder to come by, and getting another 17 and 12 performance from Mason Plumlee seems unlikely. 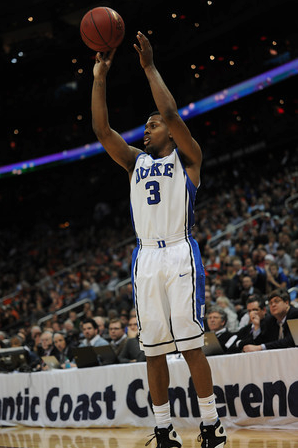 Duke’s shooters will need to be on target from the outside, especially to set the offensive tone early in the game. This has not always been a team that is great at playing from behind, but if they are able to shoot the Buckeyes back on their heels in the game’s opening minutes, we could be in for a wild one in Columbus. Be sure to tune in tonight at 9:30 to catch a can’t-miss basketball game (and hopefully another Duke victory). Stay Crazie, my friends. Every Duke student has a definitive first game experience, and mine surely did not disappoint. Duke’s surprisingly competitive win against the Belmont Bruins felt like a matchup of NCAA tournament-bound teams in late February, not a matchup of Maui-bound teams in early November. Most of my fellow students had not properly scouted our opponents and understood how good of a team Belmont actually is. For those of you who don’t know, Belmont won 30 games last year en route to an Atlantic Sun conference championship and an NCAA tournament berth. They also were extremely experienced, returning 9 of the 11 players who averaged double digit minutes last season. They also weren’t exactly flying under anyone’s radar. Belmont received votes in the Associated Press preseason basketball polls. Though they were not ranked in the preseason top 25, with the votes they had received the Bruins would have been considered the 31st ranked team in the country. Coach K unveiled his first starting lineup of the year, beginning the game with Seth Curry, Austin Rivers, and Andre Dawkins in the backcourt with Miles and Mason Plumlee up front. This was, in some ways, surprising —I personally would have opted for the much more consistent Ryan Kelly in favor of Miles and the Tyler Thornton, who has had a fantastic preseason instead of the shaky Andre Dawkins. Then again, there is a reason why Coach K is tied as the winningest coach in Division I history (more on that later) and I am not. The game began and Duke didn’t seem to jump too quickly out of the gate. The team struggled to find its footing as Krzyzewski tinkered with a few lineups throughout the first half. Strong play from Seth Curry and Mason Plumlee helped to put the team in front. Although freshman Austin Rivers did not shoot very well from the floor in his first regular season outing as a Blue Devil, he was able to create penetration and convert on many opportunities from the foul line en route to a team high 16 points on the night. On the other hand, Rivers also committed a team-high five turnovers on the game, a statistic that will certainly need to come down as the season wears on. Although Duke shot fairly well from the floor and extremely well from beyond the arc, they just couldn’t seem to put Belmont away in the first half. One of the main reasons for this was the Blue Devils’ inability to hold onto the ball. Duke turned the ball over 19 times over the course of the game, a statistic that will not hold up against most viable regular season opponents. These turnovers along with some shoddy play on the defensive end led to many open shots for the Bruins—shots that a good Division I basketball team will not miss if they are given. Belmont converted on these opportunities, and the Blue Devils held a slim, but mildly comfortable 39-30 lead heading into halftime. This was the type of game where you expected Duke to allow its opponent to hang around for the first half before returning to form and dominating the rest of the game. Last night that did not happen. Belmont came out on a 7-2 run to start the second half, trimming Duke’s lead to four. No one on the Duke sideline seemed content with this performance, and the crowd most certainly seemed out of it. 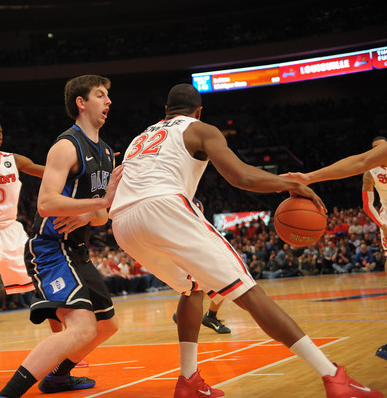 Duke continued playing cat and mouse with Belmont, maintaining a 10-point lead with 9 minutes to go in the game. With desperation setting in, Belmont began draining threes, cutting the lead to six with 8:37 to play, forcing Duke into a timeout. This was the “moment of truth” type situation we had been questioning all off-season. With the game on the line, who was going to step up lead this team? The answer was surprising, and most certainly was not how you’d have thought of this team a year ago. The first key was the play of Mason Plumlee. For the first time in his Duke career, Mason’s offensive game was not purely physical; he showed true signs of a refined post game. He was able to create down low en route to 13 points, 14 rebounds and a team high six assists on the game. He was a sure bet on both the offensive and defensive ends of the floor, and he made one of the plays of the game with a huge block in the waning minutes of the game. 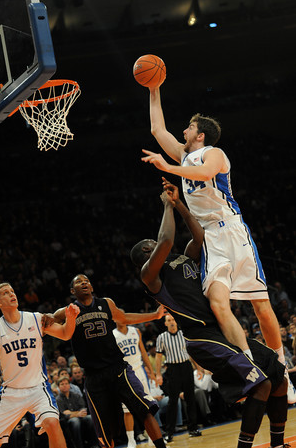 When Mason was unable to create down low, Ryan Kelly was there to pick up the slack. Kelly showed his improved post game as well, finishing down low, including a crucial three-point play with Duke holding a slim one-point lead. He finished the game with 12 points and six rebounds, but the key to his contribution was a perfect six of six from the charity stripe. In the final six minutes of the game, the subdued Cameron Crazies finally started to come alive. In a string of events that included Kelly’s three-point play, a Belmont travel, Mason’s huge block, a Mason Plumlee put-back dunk, and a Tyler Thornton steal that led to an Austin Rivers dunk, the student section caused the building to shake. 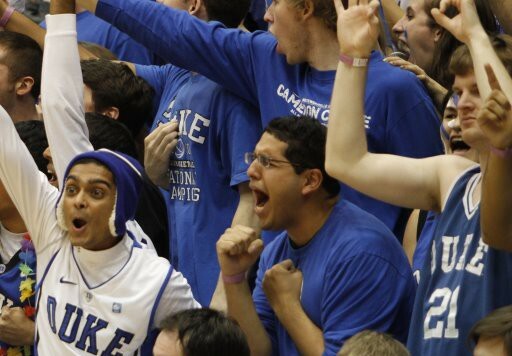 Ironically, standing in as close quarters as humanly possibly to my Crazie brothers and sisters and going absolutely crazy during an intense moment, I realized that there is absolutely no other way I could possibly take in a Duke basketball game. Being packed in together creates a bond and an electricity that is unexplainable. The true key of the Blue Devils holding onto their lead late in the game was the play of Tyler Thornton, who turned in the game of his life against Belmont. He shot perfectly from the field, including two of two from beyond the arc, turning in 10 points to go along with two rebounds, two assists, and three steals. On both the offensive and defensive ends, when there was a big play to be made, Thornton was there to make it. Tyler’s performance gained him significant recognition from Duke’s student section, who were extremely appreciative of his inspired play in such a crucial moment. With Duke’s lead down to one, it was neither of these three crucial players who would step up and drain the big shot. After Duke watched a six-point lead evaporate in the last 1:23 of the game, Duke held just a 72-71 advantage and the ball with 51.0 seconds remaining in the contest. After an inability to create in their offensive set Krzyzewski called a timeout with 27.8 seconds left. With the shot clock winding down and Duke’s sideline play seemingly broken, it wasn’t Seth Curry or Austin Rivers or Tyler Thornton but Andre Dawkins who flashed off a screen and had no fear in his eyes nailed an NBA-range three, only his second field goal in a contest where he did not shoot or play well at all. After a quick layup by Belmont, Ryan Kelly knocked down two more free throws to put the game out of reach, free throws that meant much more after the Bruins nailed a desperation three at the buzzer, giving Duke a mere one-point victory. Though there were definite areas with room for improvement, it was a hard fought win for the Blue Devils. The team most certainly struggled out there, but at least it was good to watch the team struggle and overcome the obstacle. In my experience watching Duke basketball, the difference between the Duke teams that have been very good and the Duke teams that have been national championship teams were their sense of resilience. Duke’s greatest teams have always been able to bounce back, even when they do not play their best game; they will bend and not break. The Blue Devils showed a bit of that spirit in this game. After an emotional win the Blue Devils had a quick turnaround for their next home game, facing Presbyterian College the following afternoon. The Blue Hose (let’s get all Blue Hose jokes out of the way please, we like integrity around here) proved to be little match for Duke, as the game signaled a much needed return to business as usual. The Blue Devils dominated Presbyterian from start to finish, while fixing their turnover woes, only committing 10 in the game. Duke shot an incredible 61.4% from the field on the afternoon, with stellar inside contributions from both Miles and Mason Plumlee, both of whom registered 13 points. They also added 11 and 8 rebounds respectively as the team’s top two rebounders. Both Miles and Mason added huge dunks off of baseline drives about three minutes apart midway through the second half. No one in the building was happier to see this than younger brother Marshall Plumlee, who was up and out of his seat on both occassions and could not contain his brotherly excitement. Austin Rivers played a much-improved contest, shooting five of eight from the field en route to 15 points and a team-high six assists. 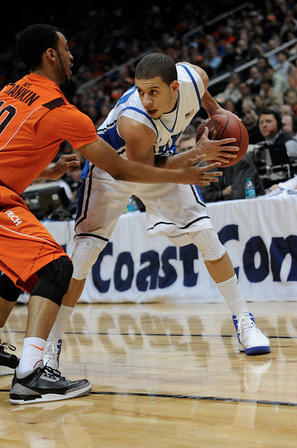 Rivers also played tenacious defense, recording three of Duke’s six steals. The Blue Devils also received stellar performances off the bench from Ryan Kelly, who added 17 points and another evening of perfect free throw shooting, and freshman Quinn Cook, who in his first extended action of the season played some electrifying point guard, recording 10 points in just 18 minutes of action. It was great to see Josh Hairston get some action off the bench after his inconspicuous absence against Belmont, recording a solid nine points and six rebounds while playing fantastic defense throughout. Even junior Todd Zafirovski got into the action in the game’s final moments. In my limited Cameron Indoor Stadium experience, it hasn’t taken long for me to figure out that Zafirovski is certainly a fan favorite around here, receiving high praise for his 0 for 1 shooting performance and lone rebound off the bench in three minutes of action. Despite only shooting 18 of 31 from the free throw line as a team, a stat that will need to improve in the next few games, the Blue Devils rolled to an easy 96-55 win over the Blue Hose. Although it seemed like a mundane victory over an inferior opponent, this win most likely marks one of the more significant wins I will ever see in my time at Duke. 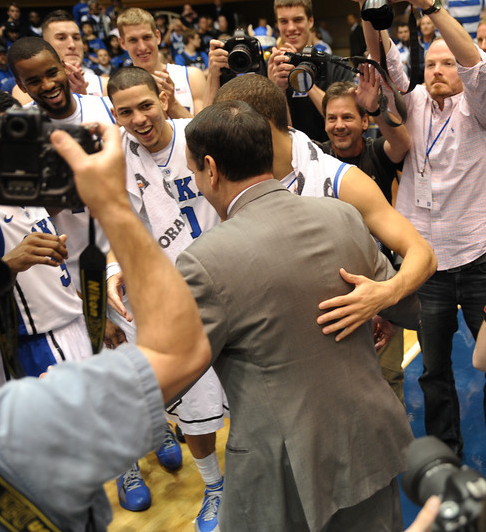 The Blue Devils’ victory marks win number 902 in coach Mike Krzyzewski’s career, tying him with his mentor, Bob Knight, for most career wins in Division I history.